Deb Salisbury: Mantua-Maker, Magic Seeker: Goals? Oh, dear. The Sisterhood of the Traveling Blog asked a hard question this month – and I must admit, it’s my own fault, since I chose the question. But I needed to ask it of myself: What are your writing goals for this year? I hate writing down my goals. I suppose I’m a featherhead, because as soon as I put them in writing, I change my focus. There are too many unfinished projects in my WIP pile. Now if I have a real deadline – set by an outside source (like the Sisterhood, ahem) – I’ll button down and perform. I’m not good with self-set goals. 1) Finish four sewing patterns – all technical writing, and my source of income. 2) Finish Iron Core – I’m a bit stuck at the moment. I think I need to rethink and re-outline. 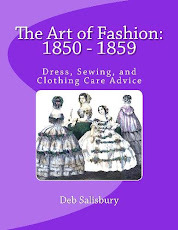 3) Work on my Regency Fabric Glossary – more of a research project, but it goes along with my little business of historical sewing patterns. It’s also my current heartthrob, for some odd reason. 4) Work on Rose Blue – which is also stuck and in need of rethinking. I suspect I need to add a sidekick. But there’s so much ahead of it on the list! I’m a terribly single-track person, so half my “stuck” problem may be too many projects. What writing goals have you set for this year? Are you still on track? Were you able to decide on any goals in particular, or do you have trouble committing, like I do? Oh that is a tough one. I would like to enter some short story competitions. At least one. And improve my blog with some good posts and maybe expand it a bit - don't know how yet. Good question! Goals? :shudder: Wake up every morning, breathe in and out all day, do a lot of writerly things and try not to let anything derail me. As you can tell, I'm not much of a goal-setter. Most of the writing goals I've had in previous years were dependent on the actions of other people (agents, etc.). Now I just do the best I can and let everything hash out the way it will. Sounds like you've got some great projects going on! Thanks for sharing your goals for 2011. I've put my goals out there and I'm ready to reel them in and make them more manageable, ha ha! Hi Sophia! I love your blog, so you're well on track there. :-) I find entering competitions scary! LOL, B.E. - you sound so much like me on the subject! ROFL, Lydia - I'm worried I've more stated dreams than goals here. Le sigh. I don't do well with goals in general. I overthink everything so by the time I set out to do something, I'm already exhausted! Lol! So I usually just dive in to most things, unprepared. I'm sure it'll hurt me in the long run and I'm working on it.